Tamsin Anderson has always been involved in music and singing but has only recently become a conductor. In fact her first career was as a solicitor in the charity sector, before she saw the light and decided to pursue her true passion. 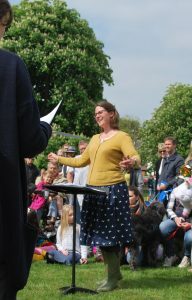 Tamsin’s conducting is rooted in her experience as a singer, and her enthusiasm and exuberance for the music comes across. She has learned from, and performed under, many of the finest conductors in UK and beyond. David Victor-Smith MBE is a major influence; with Farnham Youth Choir Tamsin was part of the winning choir in Sainsbury’s Youth Choir of the Year in 1998 and also performed on BBC’s Blue Peter. She went on to sing under Mike Brewer OBE and Greg Beardsell in the National Youth Choir of GB including a tour to Australia, New Zealand and the Pacific. She was a founder member of Andy King’s award winning Northern Spirit chamber choir and sang with Lesley Garrett and Barry Manilow. Other influences include Genevora Williams, Jim Davey, Mark Camberwell-Griffiths, Dominic Peckham, Susan Hollingworth and of course her fabulous conducting grandmother, Peggy Woolhouse. More recently, Tamsin has launched two children’s choirs at Leigh Primary School, which have already performed at Canterbury Cathedral, Sevenoaks Three Arts Festival and the London A Cappella Music Festival. She has completed an Association of British Choral Directors conducting qualification and continues to study to learn the technicalities but doesn’t let this get in the way of the her verve and joy she pours into the weekly rehearsals.